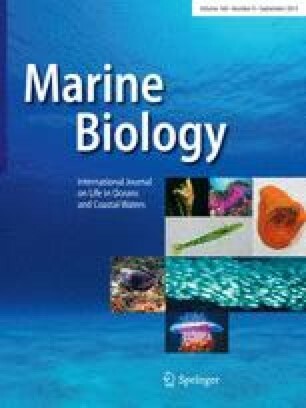 An exceptionally large midwater trawl (50 m2 mouth area) with 5 opening and closing codends was towed horizontally in the lower mesopelagic zone at depths of 500, 650, 800 and 1000 m off Oregon (USA) from 1–6 September, 1978. In comparison to more conventional trawls, ours collected more fish, including rare species and large individuals of common species. Comparison of collections made by day and by night revealed that 12 of the 15 most common species probably migrated vertically. Bathylagus milleri evidently migrates from 650 m during the day to 500 m at night. Cyclothone acclinidens and C. atraria were more abundant by night than by day at 800 m, possibly due to an upward migration from deeper depths at night. C. pseudopallida, C. signata, Chauliodus macouni, Tactostoma macropus and Stenobrachius leucopsarus were more abundant by day than by night at 500 m, suggesting that they migrated out of this depth horizon at night. Lampanyctus regalis, and large individuals of B. pacificus were more abundant by night than by day at 500 m, possibly because they migrated upward from near 650 m. Many species exhibited trends of increasing or decreasing size with depth, and several species showed changes in migratory behavior with size. For example, only small (<240 mm) T. macropus migrated vertically, whereas only large (>110 mm) B. pacificus appeared to migrate. Depths of maximum abundance of congeneric species were usually separated. B. milleri and B. pacificus had similar distributions by day, but the former was shallower at night. S. leucopsarus tended to live shallower than S. nannochir both day and night. Congeners always occurring at the same depth were Cyclothone pseudopallida and C. signata (both most abundant at 500 m) and C. acclinidens and C. atraria (both most abundant at 800 m).